FrogFuel Energized Liquid Protein shot is a medical grade, clinically proven protein supplement with 15 grams of rapidly absorbed medical-grade liquid collagen protein. with 80MG of caffeine (green coffee beans) for that extra energy boost. FrogFuel energy drink, energy liquid protein supplement is hydrolyzed for nearly 100% protein bioavailability at the cellular level. Fortified with Glutamine, Cysteine, Histidine, Methionine, Threonine, Tryptophan and enhanced with taurine. 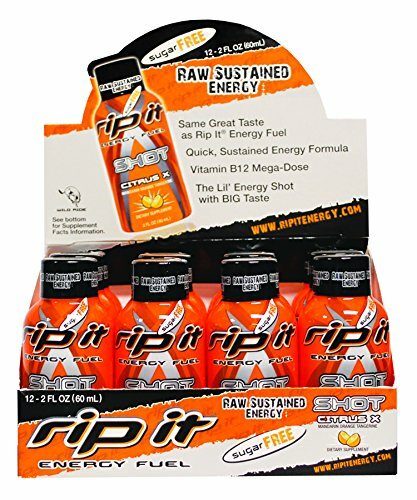 80MG of Caffeine for energy and increased performance. FrogFuel energy shots are Fat Free and Cholesterol Free for Lean Strong Muscle Mass. Clinically proven 100% protein digestibility in under 15 minutes. There is No mixing - Ready to Drink, 60 calories (All protein); Sugar Free, GMO Free, Gluten free, Lactose free, Gluten Free, Cholesterol Free and Fat Free with NO banned substances. 24 1oz Liquid Protein Shots per container. Frog Fuel is not a protein gel. 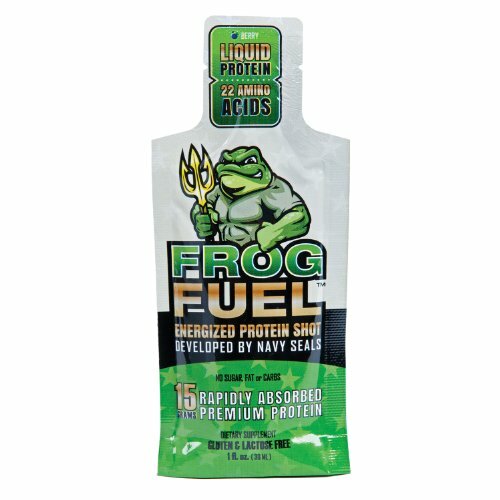 Unlike protein gels, FrogFuel is a liquid protein that is ready to drink from the packet or can be mixed with 8oz of Water. *The caffeine contained in FrogFuel comes from green coffee beans and does NOT contain the carcinogens typically found in roasted coffee beans. GU Original Sports Nutrition Energy Gel is the energy gel that started it all. In 1993, Dr. Bill Vaughn developed the world's first energy gel to help his daughter perform better during ultra-marathons, and GU has been helping to propel the world's most successful extreme athletes to success ever since. GU Energy Gel sustains all forms of athletic activity with a highly compact, portable, and calorie-dense packet that is loaded with carbohydrates that can be rapidly absorbed. Branched-chain amino acids limit muscle fiber damage and increase speed of recovery, and extra electrolytes help maintain water balance. Some flavors feature caffeine to increase concentration. While the original formula has been tweaked and evolved over the years, the end result is still the same: GU Energy Gels fuel the best endurance athletes in the world. 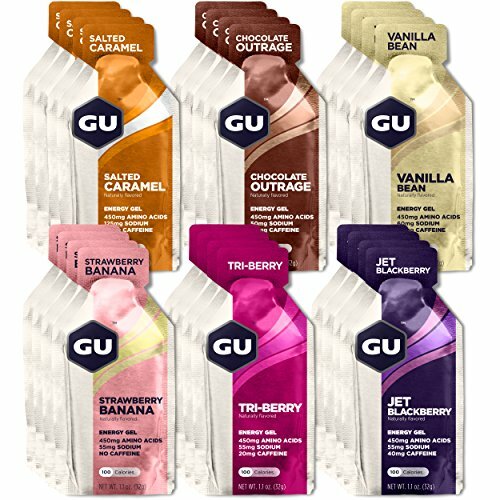 GU Original Energy Gel comes in a wide variety of great tasting flavors. Each packet contains 450mg of Amino acids, 100 calories, and at least 21g total carbs. 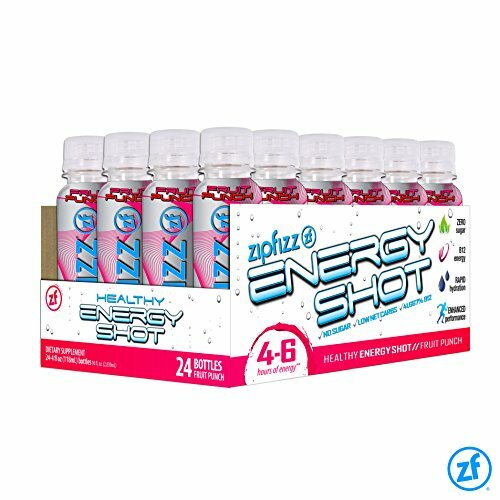 Zipfizz is an all-natural, great tasting energy drink that delivers a powerful charge of micronutrients to the body's fuel system, now in liquid shot form! 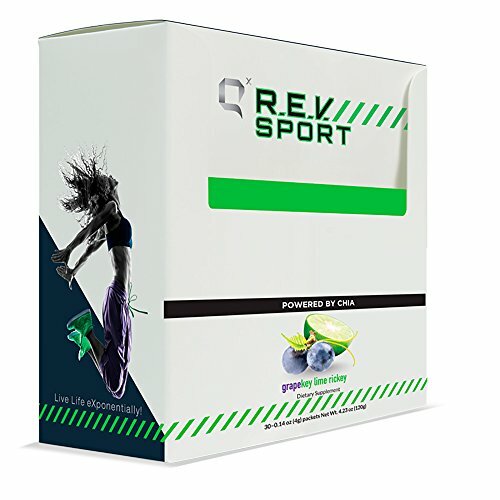 It contains no ephedra or other artificial stimulants. Most people experience an immediate, revitalizing burst of energy after taking Zipfizz.Give your body a rush of vitamins, minerals and key amino acids to protect the immune system.Zipfizz has created an advanced formula that provides a significant amount of vitamins, fewer calories, lower carbohydrates, superior taste, variety and unique packaging! Simply put, it's different because it's good for you. Use Zipfizz as a morning or afternoon pick-me-up, or enhance your training by taking it before, during, or after a hard workout. Because Zipfizz contains no sugar, users will experience increased energy — up to 4 - 6 hours with out the sudden sugar "crash" associated with other energy drinks. 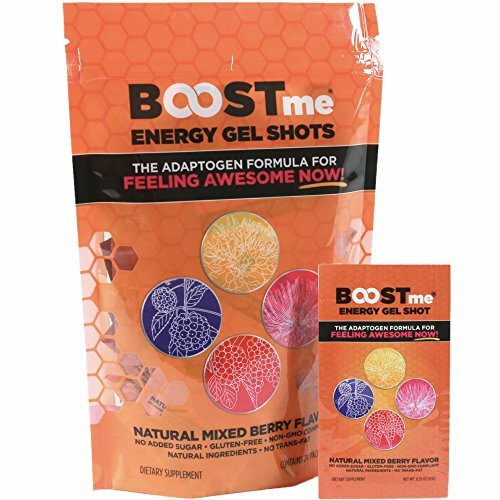 FrogFuel Ultra energy shots and protein shots are designed as an endurance fuel and pre workout supplement with protein, carbohydrates, electrolytes and Beta Alanine and Citrulline Malate . FrogFuel is clinically proven for 100% digestibility in < 15 Minutes. 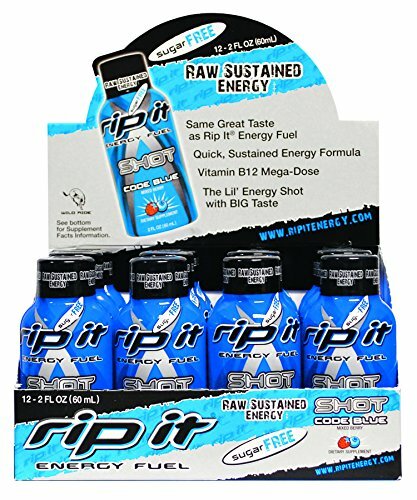 This first product of its kind to combine Protein, Carbohydrates and Electrolytes with Beta-Alanine and Citrulline Malate in a highly concentrated 1.2oz liquid protein shot and energy shot. 8g Enzyme-hydrolyzed protein for rapid absorption. 10g Carbohydrates (Simple Carbs & Complex Carbs). 1500Mg Beta-Alanine. 1500Mg Citrulline Malate. 150Mg Electrolytes. 80Mg Caffeine (green coffee beans). Fat Free, Gluten Free, Lactose Free and no banned substances, GMO free, NO artificial flavors. 24 1oz Liquid Protein Shots per container. 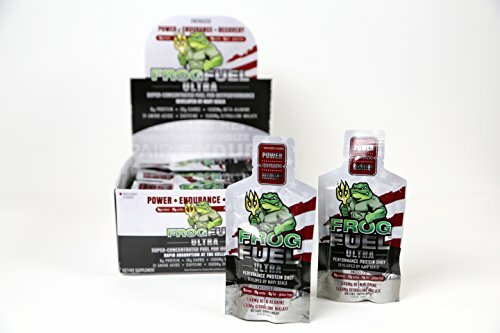 Unlike protein gels, FrogFuel is a liquid protein that is ready to drink from the packet or can be mixed with 8oz of Water. *The caffeine contained in FrogFuel comes from green coffee beans and does NOT contain the carcinogens typically found in roasted coffee beans. 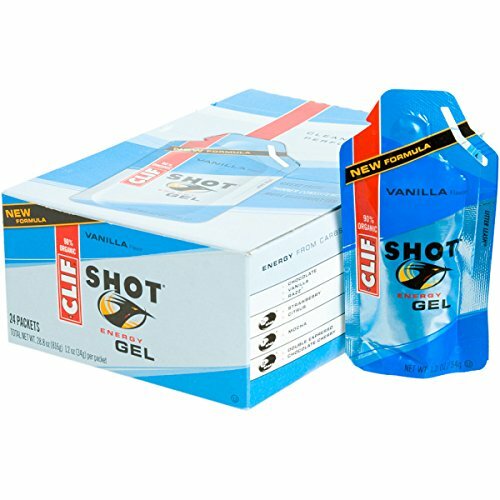 Clif Shot Energy Gel is a fast-acting, easy-to-digest energy gel with 24 grams of carbohydrates -- your body's preferred source of fuel during exercise. Within two to ten minutes, Shot's carbohydrates (both simple & complex) and electrolytes hits your bloodstream, working to sustain your overall endurance and coordination. One little packet packs a punch. Each Clif Shot has sodium, potassium, and magnesium -- electrolytes essential to helping you maintain hydration and allow your muscles to properly function. 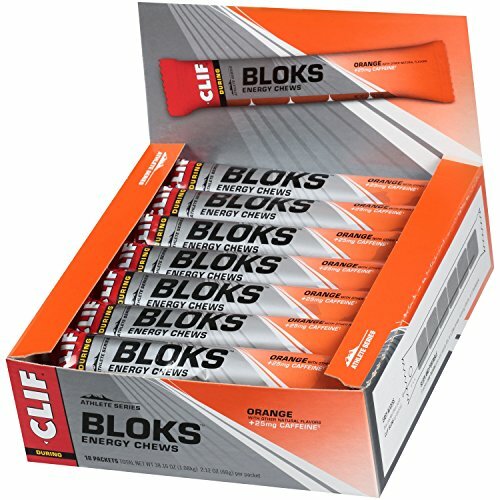 The Clif Shot Energy Gel 24 Pack comes in eight flavors -- Chocolate, Chocolate Cherry - Turbo, Citrus, Double Espresso - Turbo, Mocha, Razz Sorbet, Strawberry, and Vanilla. The two Turbo Clif Shot flavors each have 100mg of Caffeine -- about the equivalent to a cup and a half of coffee. Shot comes in a box of 24. Compare prices on Fuel Energy Shot at ShopPlanetUp.com – use promo codes and coupons for best offers and deals. We work hard to get you amazing deals and collect all available offers online and represent it in one place for the customers. Now our visitors can leverage benefits of big brands and heavy discounts available for that day and for famous brands.